Time: 10am - 5pm. The preview opening on Saturday 10th November is from 11am. It’s that time again. The end of the year when the nights draw in, the fire is lit, and we begin to focus on the festive period ahead. Our Winter Exhibition brings together some of our favourite fine artists, with a range of landscape, still life and figurative works on display. We will also be introducing some new artists to the gallery at this time, including James Sutherland, Mairi Clark, Margaret Evans and Pen Reid. Please join us for the exhibition preview opening. Doors will open from 11am on Saturday 10th November, where you can enjoy a glass of bubbly and handmade chocolates. James Sutherland is a Scottish artist who paints atmospheric landscapes and coastlines beautifully, inspired greatly by his surroundings. Also sharing this inspiration, Mairi Clark’s evocative paintings capture the ever changing interplay between sea, sky and landscape affect colour and mood in her work. Using mainly oil paint for its rich, deep and subtle qualities, she scratches into the surface creating textural effects. Her use of a wild and vibrant tapestry of colour and light ensures her abstract works have a real ‘sense of place’ by reflecting her love of the Scottish sea and landscape. Margaret Evans is a Scottish contemporary artist, an internationally respected tutor and author of numerous teaching art books. Her studio is in Highland Perthshire, an area of outstanding beauty and an inspiration for much of her work. Margaret is internationally known for her pastel work, but enjoys working in a range of mediums, with a penchant for portraiture and landscapes. 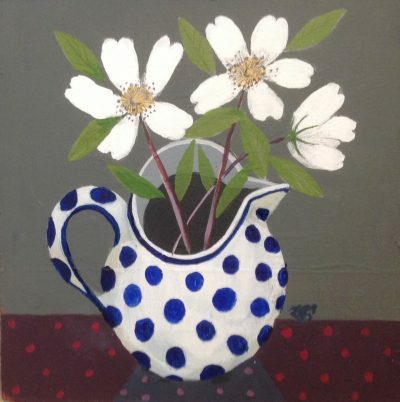 A graduate of GSA (DA) and the University of London Institute of Education (ATC), Margaret’s paintings are exhibited in various galleries around the country. Pen Reid gained her Masters in Painting and Printmaking at the Art Institute of Chicago on an International Peace Scholarship. On graduating she was awarded the Institute’s Ryerson Travelling Scholarship and the Austin Museum’s Juror’s Award. To coincide with the Kirkcudbright Galleries exhibition which opens later in the month, and includes work by the late Archie Sutter Watt RSW, we have gathered a few previously unseen works by Archie to be exhibited at this time. A few years have passed since we have been able to present new work by Archie, so we are very excited to be able to do so. We will also be treated to new paintings by one of Scotland’s most exciting contemporary artists and gallery favourite Gordon Wilson, who will be delighting us with his unique style of landscape and quirky figurative paintings, often featuring a beltie or two. Deborah Phillips will be sending some of her snowy landscapes with a touch of sparkle, whilst Jackie Henderson will be exhibiting her sought after paintings, featuring whimsical figures and very often birds, and Helen Acklam will be providing some of her wee cottage landscape paintings. Edinburgh based Jemma Derbyshire returns with some of her vivid abstract works, whilst Mairi Stewart carries on the colourful theme with her striking still life paintings. We are thrilled to welcome back Nikki Monaghan with some of her vibrant paintings, seasonal bird paintings by Stanley Bird and rich landscapes painted on glass by Tommy Fitchett. Last but by no means least, we welcome a brand new collection of framed linocut and screenprints from Colin Blanchard. Alongside the rich and varied selection of fine artists we have in the gallery for Winter, we are spoiled for choice with new collections of glass (Bobbie Coleman and Gregg Anston Race), Ceramics (Debbie Barber), Sculpture (Ean Dawbarn), Jewellery (Eileen MacAlister, Heather Andrews, Melissa James), Automata & Metal Work (Esther Smith) Vitreous Enamel Work (Janine Partington), Ceramic Sculpture (Helen Kemp, Pauline Montgomery), Textile Sculpture (Karen Norton), Textiles (Jo Gallant), Ceramic brooches & hang ups (Shirley Vauvelle), Wood Turned Bowls (Tom Cooper), Baskets (Trevor Leat), Illustrated Porcelain Panels (Wendy Kershaw) and much more. We have a wide and varied price range to suit all budgets, so come and see us with Christmas in mind if you’re looking for unique, original gift ideas. The Whitehouse Gallery is a part of the Own Art Scheme, where original work between £100-£2,500 can be spread over ten months, INTEREST FREE.